12 firecrackers that will set any occasion alight with scrumptious layers and persistance of flavour. The price of this case is lower than your teenager's jeans! Every flavour packed drop will have you smiling from ear to ear. We've included a tantalising array of varietals from regions with different specialties, so it's sure to please any wine lover in your life once it lands on your door step! Prefer a Mixed or All Whites Case? We don't blame you, and we've got you covered! Just click the blue links to find the case that's right for you. Look no further for reds that have been l-o-v-e-d by other Angels. With buy-again ratings like these, the quality of fruit, craftsmanship and complexity in this case is simply undeniable. Because we cut out the middle man, our winemakers can let their creative spirit loose on small batch boutique projects. The TLC poured in to each of these Top Shelf beauties is extremely hard to find elsewhere online. Premium fruit, quality oak and lashings of texture are all part of the fun here. This dozen is packed with reds that are fit to drink today, yet have plenty of ageing potential as well. That's why we've doubled a few juicy characters! The cleverest case of all! Each of these wines strikes the perfect balance between quality and value. This scrumptious case lands right in the middle Naked price range to ensure you're laughing all the way to the bottom of your glass every time! These wines have benefited from incredible fruit parcels, oodles of TLC, and a dash of extra Angel funding at every step of the winemaking process. This case will be at your door step in a jiffy, so you can experience the range of boutique flavour that Angel backing can achieve. We guarantee each bottle will blow you away, and we'll give you every penny back if not! Wines for all occasions...this mixed case will set you on course for success! The working week is done! Time to let your hair down, put your feet up and crack a bottle of hand-crafted juicy goodness. Perfect for any situation you might encounter on the weekend, these reds and whites will be ready to impress any guest! 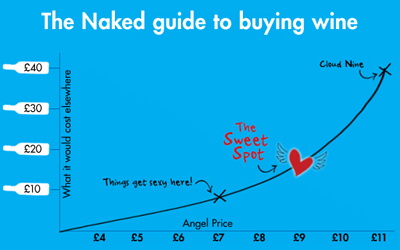 As if the winemakers included weren't attractive enough - the tiny Angel price is to die for! No doubt the wines in this box of joy are the ones you'll want to come back to again and again. Prefer an All Whites or All Reds Case? We don't blame you, and we've got you covered! Just click the blue links to find the case that's right for you. 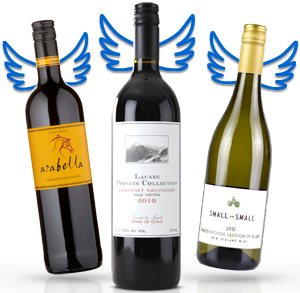 Angels, we've doubled the fun with our current Top Shelf stand out wines. This is the perfect case for those looking to enjoy premium quality local wine asap, yet also want to enjoy the rewards of laying the same wine down for some time. Balanced texture and approachable tannins are hallmarks of quality, which you'll find again and again as you progress through the Top Shelf wines we've selected for the Dux Dozen. Showcasing our most popular varietals and outstanding winemaking achievements, this dozen is the smart way to secure your share of these boutique beauties as they hit the site, before they're all drunk up! Coming in at the top of the class, this mixed case has something for every type of wine lover! Premium regions, small batch creations and a whole lot of love from our independent winemakers. It all adds up to full marks, so treat yourself to something special. We've put together an incredible line up of whites, packed with varietals and renowned local wine regions. The box that flies to your door step will be brimming with easy drinking goodness. You'll be fanning yourself down at the bargain Angel price of this case! Even better - you'll fool any fussy wino in your life, enjoying quality in each wine that extends far beyond it's modest price tag. Angel backing allows us to cut out the middle man, and this case celebrates the creative freedom our winemakers pour into each and every vintage. Prefer a Mixed or All Reds Case? We don't blame you, and we've got you covered! Just click the blue links to find the case that's right for you. Angels, this is the perfect case for those looking to enjoy top-shelf quality wines without the hassle of doing the research! This case will add a touch-of-class to your next order, showcasing our most popular varietals, premium regions, and small batch creations. The selection includes some of the newest wines to hit our Naked shelves and features top-shelf treasures. So you can be sure you're getting the latest and greatest before these small batch vintages run out! These reds are repeat offenders - Angels love 'em and they sell out fast this time of year. It has everything from easy drinking classics to oaked beauties. Because we cut out the middle man, your Angel dollar can go the extra mile in achieving quality far beyond what you'd expect from the price tag of each wine. Reap your rewards and get around this clever line up of boutique reds! They're here for a good time, not a long time. Let these heroes lead the way for your white collection! Each Top Shelf wine is filled with lashings of pristine fruit and treated with the finest winemaking TLC in all the land. Try one now, and save it's pair for later. We've packed in an array of the finest styles and renowned regions, so any white wine lover will be taken on the ride of their life. These are all made in boutique quantities, so it's a wise choice to lock in the selection while you can! Top Shelf wines guarantee you the best of what our independent winemakers can do. Angel backing has given them access to better fruit, better oak, and the freedom to age and release each drop at the perfect time for Angels to enjoy. These whites are repeat offenders - Angels love 'em and they sell out fast this time of year. It has everything from easy drinking classics to oaked beauties. Reap your rewards and get around this clever line up of boutique whites! They're here for a good time, not a long time.